Zabadani, located 20 miles northwest of Damascus near the Lebanese border, was once a popular summer destination for tourists from the Gulf. Seventeen months after the Syrian revolution began, its residents are now subject to constant and indiscriminate shelling by the army of Bashar al-Assad. Unlike the raging street battles in other parts of Syria, the armed struggle for strategic control of Zabadani has effectively reached a stalemate. 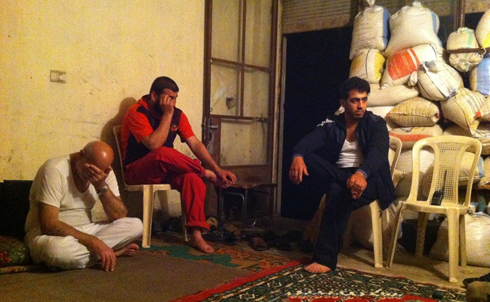 The town is, by and large, controlled by residents and fighters with the Free Syrian Army. Yet the regime has taken to assaulting the town from a distance, delivering a daily barrage of tank and artillery shells from the mountains above. 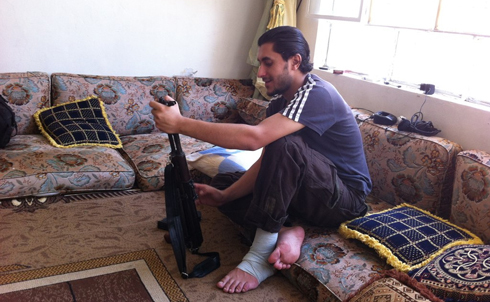 Malek al-Tinnawi, a 25-year-old volunteer with the Free Syrian Army, inspects his rifle. 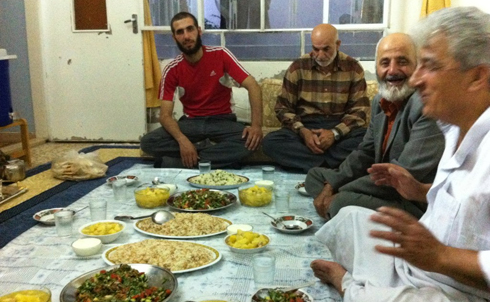 Like many armed rebels in Zabadani, Malek took part in nonviolent demonstrations at the outset of the Syrian revolution in March 2011. After repeated crackdowns by the regime—violent assaults on demonstrators and a rising death toll—Malek decided to take up arms in August 2011. “They dragged us into arming ourselves,” Malek says. Two months ago, he was shot in the leg during an assault by regime forces and is still recovering. 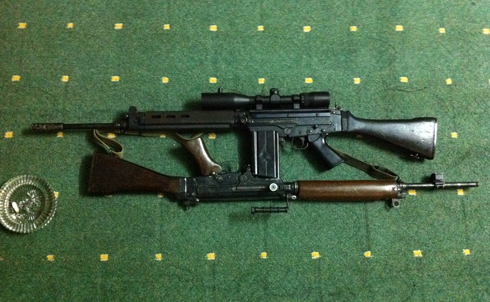 Assault rifles smuggled across the border from Lebanon to the Free Syrian Army in Zabadani. 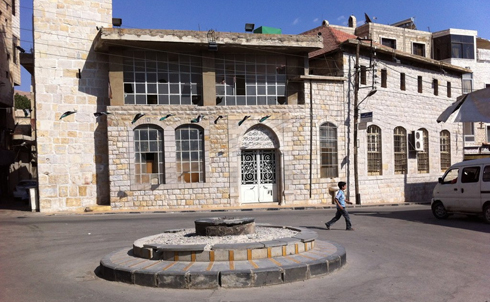 Rebel fighters in Zabadani have purchased most of their arms themselves, aided by local donations. 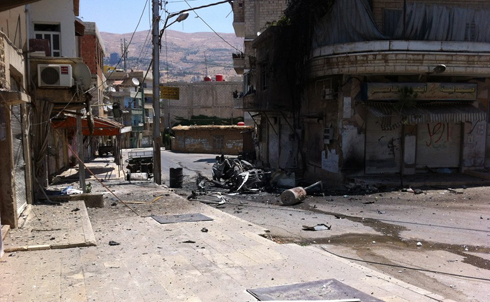 Unlike other parts of Syria, outside funding for the Free Syrian Army has not reached Zabadani in any significant way. The arms are carried in by young Syrian men and youth volunteers who trek at night across a rugged mountainous terrain that separates Syria and Lebanon. 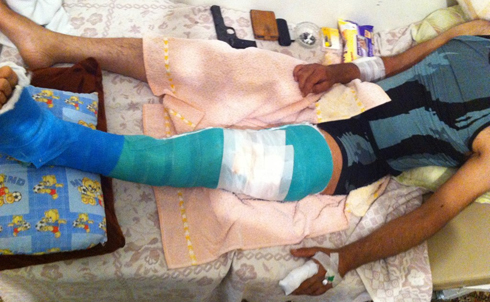 A Free Syrian Army volunteer known as “Rambo” recovers at home after being shot in the leg by regime forces. Like other parts of Syria, the Free Syrian Army in Zabadani has seen its ranks swell by soldiers defecting from the army of the regime to join the rebels. Rambo says he was lured into a trap when an army soldier told him he wanted to defect and needed his help. Rambo barely managed to escape when three soldiers opened fire on his car as he approached a predetermined meeting point. The Al-Tinnawi family awaits for the sunset prayer call that signals the breaking of the fast during the month of Ramadan. 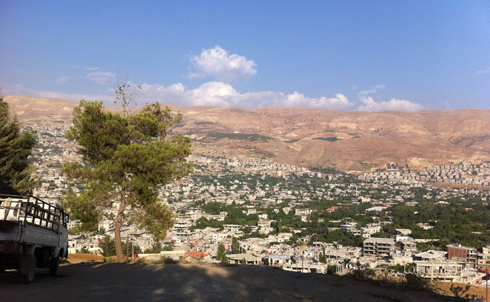 The majority of Zabadani’s residents are Sunni Muslims with a small Christian minority. 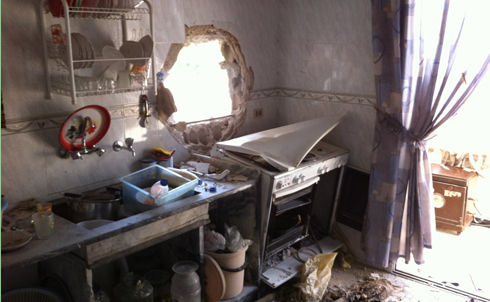 Damage from where a shell entered through the kitchen of a house on the main thoroughfare in Zabadani. The town has been under daily, indiscriminate shelling by army forces for months. 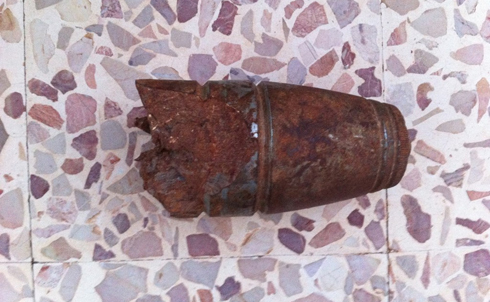 This tank shell exploded on the floor of a house in Zabadani. The Syrian army fires from tanks and artillery guns stationed more than two miles away on the mountains that surround the town. The eastern side of Zabadani is subject to far less shelling by regime forces than the western side, which is home to the Hara neighborhood—seen as the heart of the resistance. Many of Hara’s residents have moved to this side of town, staying with relatives or squatting in empty villas and apartments owned by summer vacationers predominantly from the Gulf. 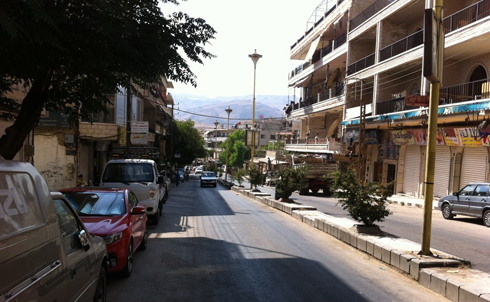 As with other towns and cities at the outset of the Syrian revolution, the demonstrations in Zabadani were overwhelmingly nonviolent in the beginning. Men and women of all ages gathered in front of a mosque in the main town square of Sahet el Jisr, what some refer to as their own version of Egypt’s Tahrir Square. 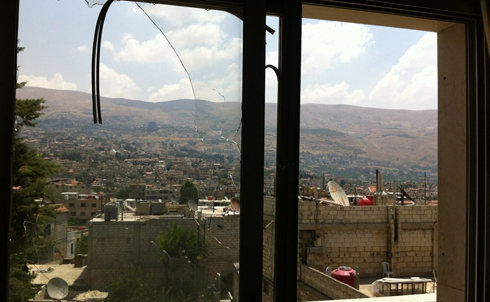 A shell exploding some fifteen years away, on an adjacent rooftop, broke windows in Kenaan al-Tinnawi’s family home. The mountains in the background are where the Syrian army has stationed most of its tanks and artillery guns that target this side of Zabadani. 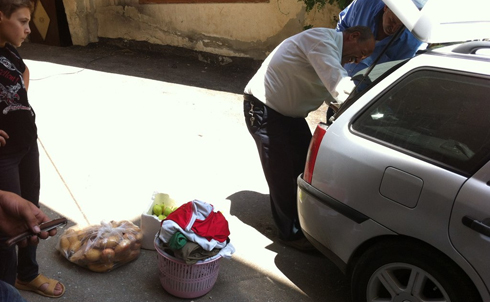 Kenaan al-Tinnawi’s family packs their things into a car as they prepare to move to a safer part of town on the eastern bank the morning after a shelling attack hits their house. Nearly all the residents of Hara have been displaced, many of them moving to the east side of town or leaving Zabadani altogether, crossing the border into nearby Lebanon. 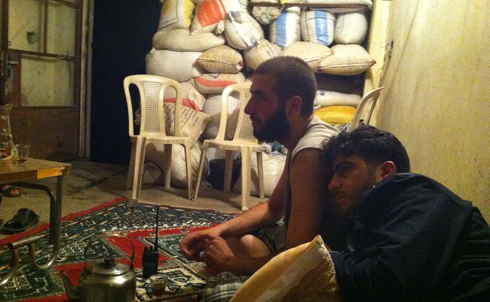 Free Syrian Army fighters Hakim al-Tinnawi and Ahmed Rahmi take refuge in a makeshift bunker during nighttime shelling. Residents gather in makeshift bunkers during heavy shelling assaults. There is little else that can be done for resident to protect themselves against the daily attacks. 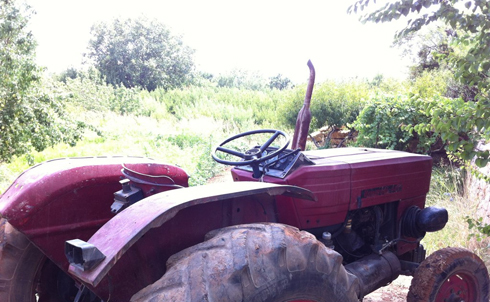 Both of the car’s passengers were killed: Mustafa al-Dahab, 58, and his nephew, 5-year-old Adee Adalati. When local residents rushed outside carrying buckets of water and fire extinguishers to try and retrieve the bodies, more shells were fired, sending them scrambling indoors for shelter. 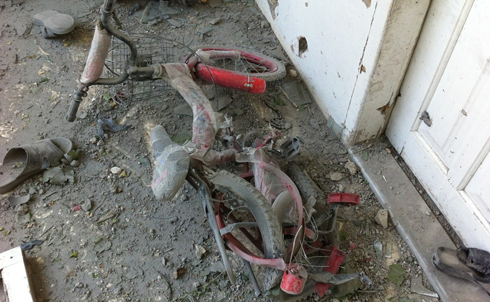 Shelling hits houses and residential buildings nearly every day in Zabadani. 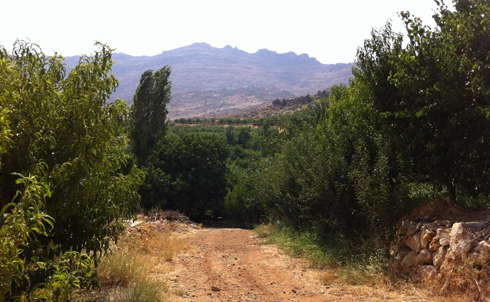 Zabadani is renowned for its fruits. The valley is filled with orchards of apples, pears, peaches and plums. The local economy, that relies primarily on tourism and the fruit harvest, is on the verge of collapse amidst the continued violence. The western mountains are known well to local Zabadani residents, who traverse the rugged terrain at night past Syrian army tanks to help smuggle in weapons and supplies.